1. David Carr reports on talks between CNN, the ratings-challenged cable news pioneer, and Anthony Bourdain, the macho chef/traveler of Travel Channel fame. CNN execs are trying to address a problem I discuss in my new book (Covering America), which is much easier to formulate than to solve: what can a news-oriented cable channel do to fill all those hours when all hell is not breaking loose? 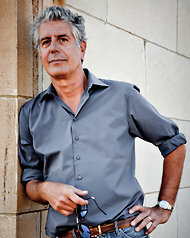 Bourdain could be part of the answer. What else might help CNN? You comment; you decide! 2. Following up on the recent cutback in printing by the New Orleans Times-Picayune, comes a look at the broader trend, including some pros and cons. 3. From London, word that Rupert Murdoch’s troubles extend into an area he really cares about: the circulation figures of his newspapers. 4. From Shantou, a piece about how tricky it can be for Westerners to teach journalism to Chinese students in China. As a Westerner who teaches journalism to Chinese students in Boston, I can certainly sympathize. This piece also includes a bonus: an answer to the question of what Peter Arnett has been up to since he was forced out of CNN (in a failed attempt to pump up CNN’s prime-time audience ratings — see item #1 above).